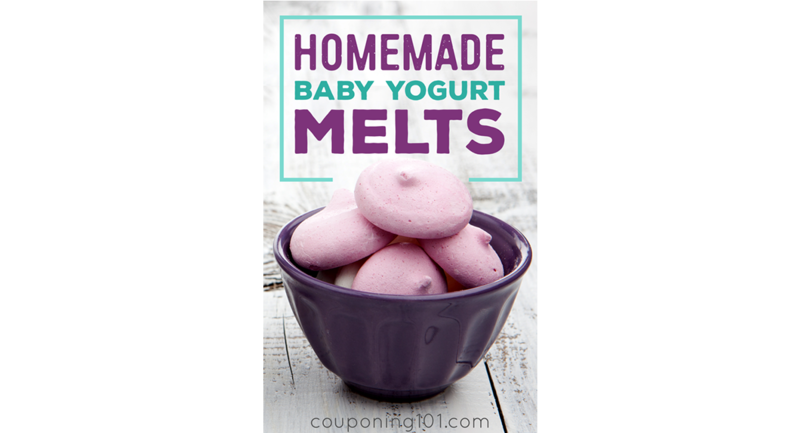 Check out this awesome frugal tip that Melissa sent in for how to make your own homemade baby yogurt melts! Line your baking sheet with parchment paper and make sure you have enough room in your freezer for the baking sheet. Puree the fruit with about 1/4 of the yogurt in a blender or food processor until smooth. Pour into a mixing bowl and fold in the rest of the yogurt. Then pour the mixture into a small piping bag or a ziplock bag with the corner cut. Make little blobs on the baking sheet and pop them into the freezer for about 3 hours or until solid. Quickly and carefully peel the blobs off the parchment paper and toss them in a freezer-safe plastic container or baggie. Freeze up to a month, but they probably won’t last that long! Hi! How long will the yogurts drops last in a nappy bag before they melt and turn into runny yogurt? Anyone know what temp the oven should be, and how long to bake them for? Hi Taylor – For this particular recipe, no baking is required! Just freeze them on a baking tray until they are solid, then carefully peel them off and store them in the freezer until ready to serve. I used frozen blueberries and it ended up being too liquidy. I bought gelatin to thicken it up but have no idea how much to use. Any thoughts? Can you substitute coconut milk for the yogurt? How long would these last in the freezer/deep freeze? This is a perfect summer snack. Healthy n delicious! This is so awesome! Can’t wait to try it soon.